And the results for TOEFL and TPA test finally arrived yesterday. 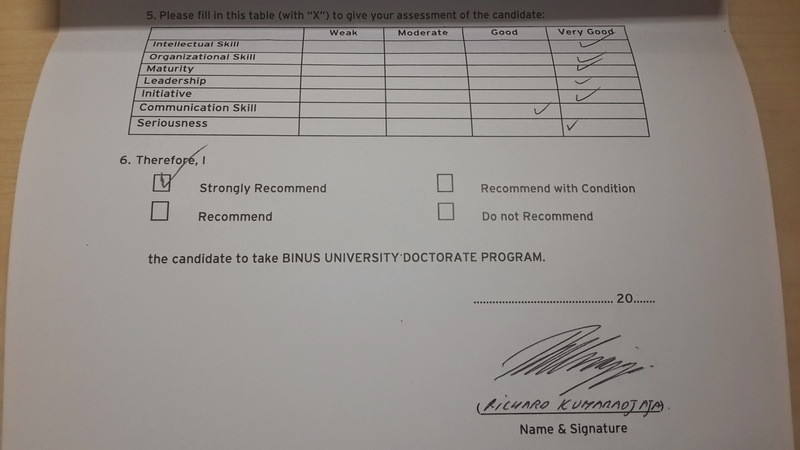 Dan untuk Hasil Final dari proses Penerimaan Program Doktoral di BINUS University ini, akan saya informasikan kembali setelah proses interview dijalankan dan direview oleh Sekretariat DRM. Demikian informasi yang dapat saya sampaikan. Apabila ada pertanyaan lebih lanjut dapat menghubungi saya kembali. Terima kasih. The passing grade is 500 for both of them, gladly i passed it. Thanks God. Doctorate program requires me to have at least 2 Recommendation Letter for taking the program from any Doctor or PhD. My Mom was the 1st giving me the recommendation. And then yesterday also the day i got the 2nd Recommendation Letter from Pak Richard K, PhD for taking the doctorate program. . Thank you Sir for stopping by my office, discussing projects, and also signed the letter.